* This is my article in BusinessWorld last Monday, July 16. Government has the tendency to throw its weight around, especially affecting people and private enterprises that it regulates. If players are deemed “friends” or crony of the administration in power, they enjoy kid-glove treatment, allowing them to get off lightly in terms of penalties and fines. Otherwise, if the players are outside the circle, they get hefty fines or threatened with closure. When Uber was still operating in the Philippines, the Land Transportation Franchising and Regulatory Board (LTFRB) slapped it with multiple penalties: (a) Suspension of operation for about a month or two, (b) a fine of P190 million, and (c) required Uber to give allowances to their drivers while the suspension was in effect. Taken together, these fines plus legal costs have been estimated to reach P500 million or higher, a huge amount. Last week, the LTFRB fined Grab P10 million for charging two pesos per minute on trips taken by its passengers, saying that it didn’t approve these fees. Meanwhile, passengers have agreed — and continue to agree — to pay for these fares, even before they take trips using ride-sharing platforms, including Grab. If passengers are unable to afford ride-sharing services, they have the option to take regular taxis, UV expresses, or a combination of other modes of transport. Most commuters have refrained from using ride-sharing services owing to their cost. Only about 2.7% of the total number of commuters use ride-sharing. The LTFRB uses two price control policies: (a) surge price control to twice the fare amount, which was later cut down to 1.5x, and (b) abolition of P2/minute charge as a mechanism to offset the big decline in (a). We now try to show the effect of these two measures on both passengers and drivers. In the graph below, Pm and Pc means Market Price and Controlled/Capped Price. Likewise, Qm and Qc means Market Quantity and Controlled/Capped Quantity. When there is no price control, when Pm prevails, passengers and drivers agree at point A and passengers get a ride soon, resulting in short waiting times. When price control is imposed, when Pc prevails, those policies remove incentives of many drivers to go to high traffic areas to pick up passengers. This reduces the supply of drivers during the times when they are most needed and makes the supply curve shift from D1 to D2. Passengers’ waiting times become longer, prompting some of them to take regular taxis — assuming these are readily available — or take multiple transport modes to reach their destinations. So passengers’ demand curve also adjusts to the left, from D1 to D2. Only those desperate to get a ride-sharing service would stay and wait longer until a car arrives, and they meet at the new equilibrium or market-clearing price at point B. The move from point A where Pm prevails to point B means movement from Qm to Qc. The difference between the two represents the unserved passengers and bookings, people who are forced to either take cabs or multiple rides. Taking multiple rides is fine if one is wearing casual attire, or not carrying valuables such as laptops, documents, and cash, or not accompanying a child or an elderly person. Are passengers given more “safe, convenient, affordable ride” at point B than point A? If LTFRB Chairman Martin Delgra and party-list lawmaker Jericho Nograles are asked this question, very likely they will say: Yes. After all, they have drivers and vehicles, all funded by taxpayers and are not subjected to long waits to get a ride. If the ordinary passengers and ridesharing companies and their partner-drivers are asked, very likely they will say No. Passengers are forced to wait longer, even if they are willing to pay higher prices for their trips and drivers experience lower income. A related issue is the franchise control policy of LTFRB. It limits or puts a cap to total number of cars available for ridesharing platforms. When Uber exited the region last April, it had 19,000 drivers in the Philippines but only 11,000 were absorbed by Grab because LTFRB did not accredit the remaining 8,000. This alone created a huge backlog in terms of getting rides. If the LTFRB removes its franchise control policy, at least 10,000 new drivers and cars would be on the road. That decision will help entrepreneurship and allow Filipino workers abroad to finally stay at home with their families. The graph can also apply here. No franchise control means the supply of cars will be at Qm and passengers and drivers can “meet” at point A. 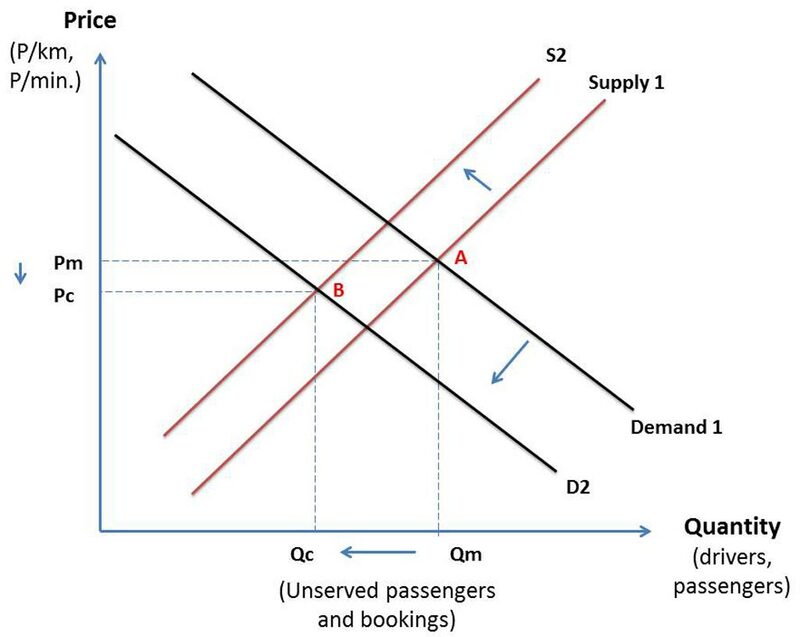 With franchise control, the supply of vehicles will be at Qc and the supply curve moves from S1 to S2. Passengers will have longer waiting times under S2 and some will take other transportation services like regular taxi and multiple rides. So passenger demand will move from D1 to D2. The shift from Qm to Qc means more inconvenience, more unsafe passengers even if they have the extra money to pay for higher fares. If government via LTFRB is sincere in helping the public get “safe, convenient, affordable rides,” it should remove its fare control and franchise control policies. If LTFRB officials are retiring soon, they should aspire for goodwill from the passengers and ridesharing companies they are regulating. Retiring with ill will from the public is not a good way to leave.